Recombinant fragment within Human Integrin alpha V aa 1-250. The exact sequence is proprietary. WB: HUVEC, HT-29, A549, C6 and NIH/3T3 whole cell lysates; Human fetal kidney and fetal brain lysates; Mouse brain, kidney and spleen lysates; Rat brain and kidney lysates. IHC: Human kidney, human transitional cell carcinoma of bladder and mouse kidney tissues. ICC/IF: A549 cells. IP: A549 whole cell extract. Our Abpromise guarantee covers the use of ab179475 in the following tested applications. WB 1/5000. Detects a band of approximately 125, 135 kDa (predicted molecular weight: 116 kDa). Diluent: 2% BSA in 1X TBST. Blocked using 5% BSA for 1 hour at RT. Immunofluorescent analysis of 100% methanol-fixed, 0.1% Triton X-100 permeabilized A549 (Human lung carcinoma) cells labeling Integrin alpha V with ab179475 at 1/500 dilution, followed by Goat anti-rabbit Alexa Fluor® 488 (IgG) (ab150077) secondary antibody at 1/400 dilution (green). Confocal image showing membrane and cytoplasm staining on A549 cell line. The nuclear counterstain is DAPI (blue). Tubulin is detected with ab7291 (anti-Tubulin mouse mAb) at 1/500 dilution and ab150120 (goat anti-mouse AlexaFluor®594 secondary antibody) at 1/500 dilution (red). -ve control 1: ab179475 at 1/500 dilution followed by ab150120 (AlexaFluor®594 Goat anti-Mouse secondary) at 1/500 dilution. 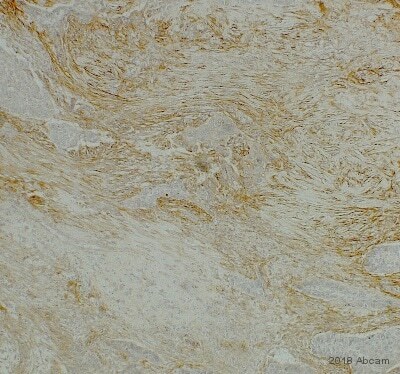 Immunohistochemical analysis of paraffin-embedded human kidney tissue labeling Integrin alpha V with ab179475 at 1/500 dilution followed by Goat Anti-Rabbit HRP (IgG H&L) (ab97051) secondary antibody at 1/500 dilution. Membrane and cytoplasm staining on human kidney tubules is observed. Counterstained with hematoxylin. Integrin alpha V was immunoprecipitated from 1 mg of A549 (Human lung carcinoma) whole cell extract with ab179475 at 1/40 dilution. 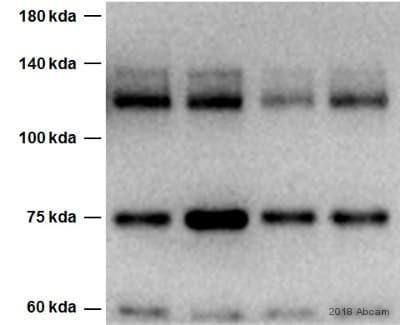 Western blot analysis was performed from the immunoprecipitate using ab179475 at 1/1000 dilution. Anti-Rabbit IgG (HRP), specific to the non-reduced form of IgG, was used as secondary antibody at 1/1500 dilution. Lane 1: A549 whole cell extract. Lane 2: PBS instead of A549 whole cell extract. ab179475 can recognize 135kDa full length Integrin alpha V and 125kDa heavy chain. The 125 kDa band is Integrin alpha V heavy chain. Observed band size: 125,135 kDa why is the actual band size different from the predicted? Immunohistochemical analysis of paraffin-embedded human transitional cell carcinoma of bladder tissue labeling Integrin alpha V with ab179475 at 1/500 dilution followed by Goat Anti-Rabbit HRP (IgG H&L) (ab97051) secondary antibody at 1/500 dilution. Membrane and weak cytoplasm staining on human transitional cell carcinoma of bladder is observed. Counterstained with hematoxylin. Immunohistochemical analysis of paraffin-embedded mouse kidney tissue labeling Integrin alpha V with ab179475 at 1/500 dilution followed by Goat Anti-Rabbit HRP (IgG H&L) (ab97051) secondary at 1/500 dilution. Membrane and cytoplasm staining on mouse kidney tubule and glomerulus is observed. Counterstained with hematoxylin.